Once he'd arrived and we had all enjoyed a late dinner-- late to us but right on time to Joel's Dad as he was still operating on west coast time-- we had to put the boys to bed. But it wouldn't be easy. Sending children to bed immediately after company comes to the house is equivalent to forcing them to nap to or three gifts into Christmas morning's festivities. But once assured that Bampa would, indeed, be here when the awoke the next morning, they were fast asleep. Thud. Louder thud. Train whistle. I sat up out of bed and nudged Joel. What was Cael doing? This is a question that I ask myself so frequently and wonder if I'll ever be able to put to rest. Memories of hundreds of Saturday morning catastrophes flashed before my head. I jumped out of bed and headed down the stairs when I heard the theme song to "Thomas the Train". "They're two, they're four, they're six, they're eight, shunting trucks and hauling freight..."
This song has become become so commonplace in our home that it has become part of the background static of our lives. It's eerie harmony blends in with the drone of the dishwasher and the clunking of the ice machine as it empties new ice into the tray for Graham to stealthily hoard and melt in puddles on the kitchen floor. I saw Cael run by at the bottom of the stairs, therefore reassuring me that he hadn't pulled the television down on top of himself. What a relief, too. I really love that tv. 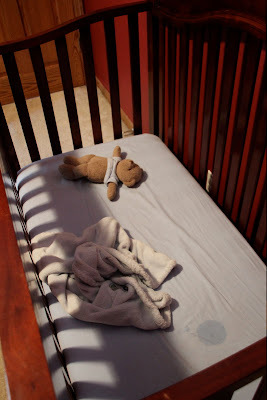 Knowing that Cael was safe for the meantime, I headed into Graham's room to release him from his wood-railed cell. I opened the door and immediately smelled the stench of "buh poo". "Bubba, did you do a big poo?" All that was in Graham's crib was his blanket, bear, and a wet pool of drool where his head had once been. I didn't immediately panic, as I have learned that my children are capable of many things I can't explain. I quickly ran downstairs to find Cael and Graham squealing with delight while Bampa lay face down on the carpet. Where to begin. If he was asleep, I totally sympathize. Both of my boys pack the punch of an entire case of Red Bulls, but I have learned that no matter how exhausted one may feel, falling asleep in their presence is neither advised nor achievable. They are extraordinarily loud and tend to use their Kid-Dar to identify the exact moment you are about to fall asleep and either stick a finger in your ear or hurl their entire body weight in such a manner as to land on whatever joint happens to give you the most trouble. Cael ran at full speed and crashed onto Bampa's back and a few steps behind was Graham, doing a weaker and less enthusiastic impersonation of his older brother. And with his blasé attitude and exclamation, he toddled over to Bampa and threw his chubby tummy on the top of the pile. Bampa rolled over and tickled both boys as stubby legs waved about and tiny bottoms stuck up in the air. Understanding that this was indeed a wrestling match (much like the one in the video above) and not a botched medical intervention, I headed upstairs to make breakfast for my boys. Once locked and loaded into their chairs and enjoying a quick PB&J (why isn't that a breakfast food, anyway?) we had an opportunity to talk. "Cael, when I put you to bed last night, we talked about how you should NOT wake up Bampa." "Because Bampa had a long flight and is really tired. Plus he came from Seattle, and it's earlier there. So when you woke him up at 6:00, it felt like 4:00 to him." "Why the time is different?" Rookie mistake. Never attempt to explain time zones, the gravitational pull of the moon or tornadoes. These things are simply over their heads, and you lose some credibility as a parent when you are unable to explain them. "Okay, well... The time is different because the west coast is so much further, well, west... so... the sun is behind there because it rises in the east and sets in the west... right? So the day starts later and ends later and it just feels different. Because it's further west. Got it?" Right. Trying to get back on topic, I questioned Cael again about his motives. "Cael, why did you wake up Bampa?" "Because the kitty threw up on the carpet and it was yucky." "So you woke up Bampa? "No, Mommy. I made him clean up that yucky throw up." I thought briefly of how to compose a nice cross-stitch or welcome mat, perhaps; something warning our guests that upon arrival, they will be awakened from REM sleep, forced to clean up voluminous poops and scoop cat vomit. But isn't that what family is all about? No? Are you sure? LOL, LOL I love the part about the cat! LOLOLOLOLO! Oh my! 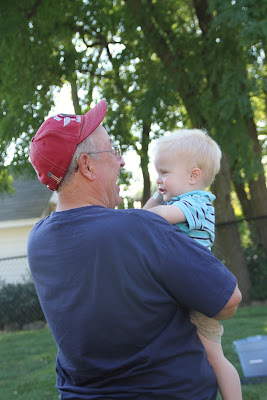 We have a little boy in our house, who loves to roughhouse with his grampas and gammies.And its all made worse ( or better? )by the fact that the grandparents absolutely love it! Good stuff you never explained the Poo smell though. Shawna- I think people would be charging ME to stay at Hotel Foreman. Derick- Anything you can imagine about the poo smell is true. If the air had a color, it would have been orange. Or green. and yep, that's how it is here at my house some days. Except with dog vomit. Kelly- I sympathize! Such is the life of a mom. The best I can hope for each day is that my dog and cat don't throw up on the same morning. A girl deserves that much, right?